The building facade is painted in Jotun’s Copenhagen Green. Photo © Nicholas Worley. Back in Spring, I made time during Clerkenwell Design Week to visit the new Mater Earth Gallery. I am a huge fan of their soft, organic aesthetic and unwavering dedication to sustainable design. So when I heard they were setting up a new concept store in London all the way from Copenhagen, I had to see it for myself. Part of the new wave of Scandinavian minimalism, Mater was founded in 2006 with ethical and sustainable practices at the core of its design philosophy. Collaborating with an external team of new and established designers, the brand seeks to create timeless pieces rooted in high-quality craftsmanship. – Henrik Marstrand, CEO & Founder. Mater’s rostra of designers speaks like a who’s who of design royalty; including Space Copenhagen, Eva Harlou and Pederjessen. Expect to see natural oak, cork and cane running through the collection. The Victorian building has been given a sympathetic update with brushed brass skirting and soft grey walls, blending down to the tiled floor in a similar tone. Inlaid brass edging lifts black and white mosaic tiling while dark green open shelves display a selection of ceramics, artisan teas and Eva Harlou’s Double Bottle design. 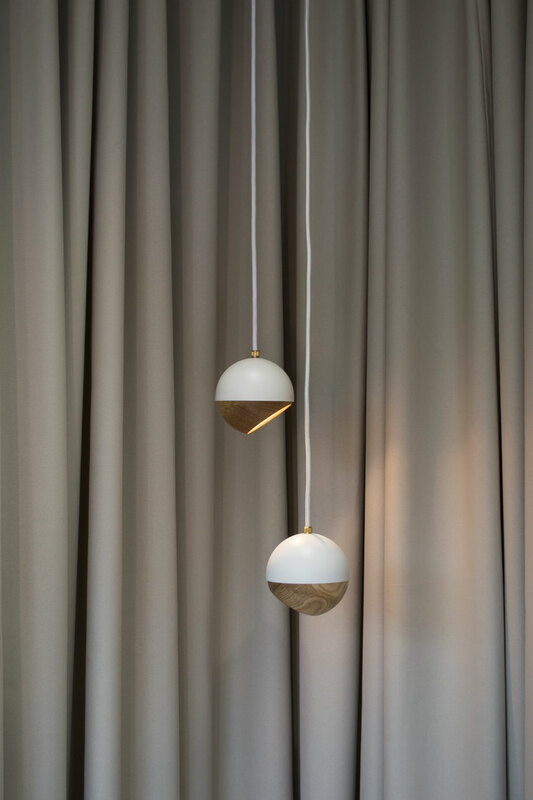 White Ray LED pendant lamps made from steel and FSC oak, designed by Pederjessen. ‘Grace’ a modern interpretation of the vanity table in FSC oak, inspired by the 1930s femme fatale, designed by architect Eva Harlou. The Winston daybed designed by Eva Harlou revives the use of cane. A daybed to die for – had I the space for it. The Winston, named after Churchill blends classic cane made in a 3rd generation Danish wicker workshop with a contemporary silhouette. The canvas seat is GOTS certified and the oak is FSC certified. A cosy space in soothing grey. Photo © Nicholas Worley. A clever design – the Ray lamp has a magnetic oak shade which can be adjusted to direct the light accordingly. This is a calm space in which to see the collection. I instantly see soothing, tactile shapes when I think of Mater. From smooth Sørensen leather to the cupped oak of the Ray lamp, there are curves in almost everything here, bringing it all back to nature’s form. Exploring the range of sustainable materials Mater use within their collection. It’s easy to stick a sustainability label on something and assume that’s enough proof, but each step of the production process has a knock-on effect. You could say that it would be more sustainable to use the furniture we already have above making more. That said, it’s important that designers and manufacturers move forward and claim greater responsibility in the way things are produced. As consumers, we need to educate ourselves in these practices and in turn change the way we consume. And of course, no production process is completely perfect, but better to be meticulous with what you do have control over than to ignore it entirely. The amount of plastic we’re now having to find solutions for speaks volumes that old attitudes won’t fly anymore. From day one, Mater has taken steps to ensure their practices take responsibility for supporting craftsmen with a fair living wage, good working environments and that their processes don’t have a negative impact on the environment. This includes looking at water usage, the disposal of waste product and the social impact. Most of their collection is manufactured with FSC approved wood or mango wood which is a by-product of the mango fruit industry. The trees are felled after they no longer fruit and a new one is then planted in its place. They also use recycled aluminium (as seen in Space Copenhagen’s stool) and LED lighting in a bid to make their lighting energy efficient. Modernist silhouette – the Trumpet coat stand, designed by Space Copenhagen. If you’d like to find out more about Mater’s journey in sustainable design I would urge you to visit the London showroom. Experience the collection for yourself and ask as many questions as you like, the team are lovely. 36 Myddelton Street, Clerkenwell, London.